A sneak peek at my US schedule! Wrapped up the hectic shoot of Teen Patti on Friday pretty much in time and reached US this morning at 7 am. All of you must be thinking that I would have got used to such trips till now, but it always is exhausting for me, travelling the trans continent way! So, after checking in the hotel in New York, I plan to relax today and tomorrow, to get fully rejuvenated and charged up for the series of events that are scheduled to follow from Wednesday. 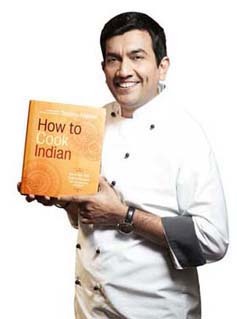 While the morning of April 1, 2011 will commence with a taping at Darshan America, the evening will see my first book for the international audiences, How to Cook Indian being released at the Indique Heights, Wisconsin Circle. It has been a long held passion of mine to document Indian recipes for people living outside India and I’m really excited about this launch! The book release will be followed by a dinner reception and question answer sessions. 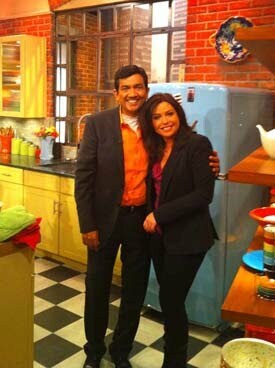 And a bit from the rest of my schedule; on March 30, I will be taping for Rachael Ray show with a demo in the morning alongwith an interview with Allison Beck, the Editor from Entertain & Holiday later in the afternoon. Both these events are scheduled in New York. On March 31, I will be travelling to Philadelphia for a taping for The 10! Show NBC Philly with a demo followed by an interview with WHYY-NPR around lunch time. Later that day, I will be attending an event at Barnes & Noble Booksellers. Also, there is an event to attend at the Gaylord Restaurant, Chicago on April 2, whereas on the 4th, I will be in Toronto for media meets and demos. Ever wondered why you feel so tired by late afternoon? In fact, some people say they feel so tired that it is difficult to cook for the evening, let alone eating the food! The fact is that the body requires refueling during the day and if not done timely, the blood sugar level takes a dip: hence you feel tired and irritable. Without nourishment, your body begins to reach out for the next best thing – stored fat and the protein in your muscles and organs. This weakens you and could eventually make you sick. Some recent research also shows that you might be increasing your chance of gaining weight. Your body thinks it’s starving when you don’t eat, so it slows down and saves all the food you ate yesterday and before. By the time you do eat, it has a stock kept ready for the next bout of starvation. A good change that one can make to have a life with healthier eating habits is to introduce some snacks that do not provide high calories. For having a snack between meals to satisfy the hunger pangs is just as important as having a full meal later on. It also helps to keep your plan of a balanced diet in line. The best way to stave off starvation without guilt is to snack on good food. Like fresh fruits, a bowl of yogurt made with skimmed/ cow’s milk, raisins, plain popcorn, raw vegetables, whole-wheat flour cookies, home-made milk shakes (made with skimmed milk, fruit and ice), fruit and vegetable juices, low-fat cottage cheese etc. · When it comes to milk and milk-based products that can threaten the heart, the safest is skimmed milk. · Soya milk, which is readily available, is a good idea with breakfast cereal. It is a better source of protein than cow’s milk. For a nice change in the dessert category, try Soya Milk Brown Rice Pudding. · Tofu might taste bland on its own but is good in stir-fries and kebabs. Stir Fried Broccoli and Tofu with Cracked Pepper is a palate cleansing starter. · Chickpeas, green gram and lentils are other good sources of protein that need to be included in the daily diet. · Research on fats also states that the body needs some fat and since it is good to have mostly monounsaturated fats. Have onions and garlic to protect the heart. · Include dark greens, carrots and tomatoes too. Fish eaters who can have oily fish twice to thrice a week will be including omega 3 that helps in controlling heart disease, eczema and arthritis. Grilled Fish with Corn and Pineapple Salsa is a wonderful meal by itself. Come summer vacations and tourists flock toward the cooler climes of the mountains. Kashmir is a favoured spot. Kashmiri cuisine is a rich tapestry of Indian, Iranian, Afghani and Central Asian styles of cooking. The intermingling of all these styles has embellished the Kashmiri kitchen superbly. Kashmiri cuisine has a trademark: that is dry ginger, fennel, red chillies, curds and mustard oil. 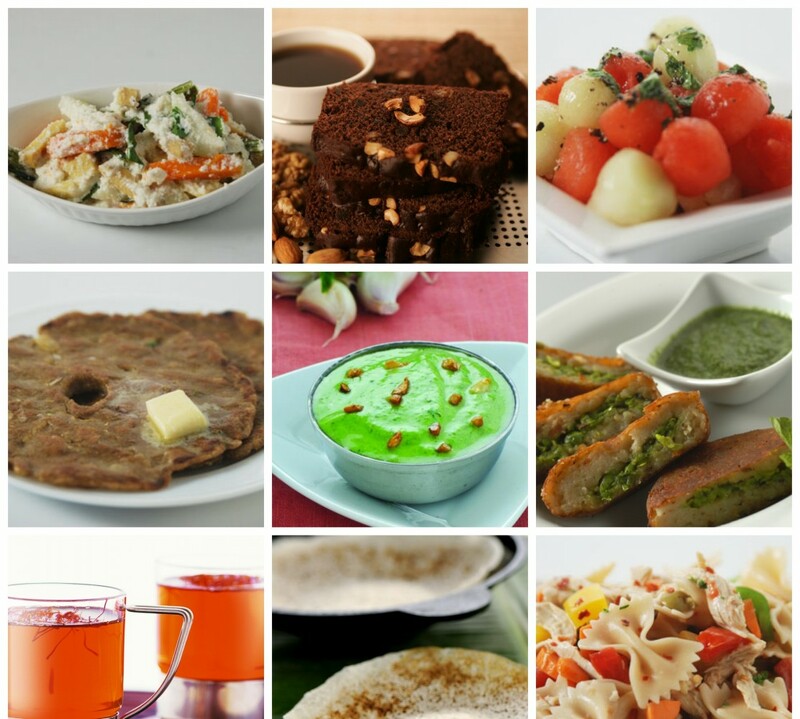 Even though it is dominated by non-vegetarian fare, the vegetarian delicacies manage to carve a niche for themselves. Cottage cheese or ‘chaman’ as it is called, is also a popular accompaniment to many non-vegetarian and vegetarian dishes. For a simple preparation look up Tamatar Chaman. Puddings, snacks and curries are studded with an abundance of dry fruits like walnuts, dried dates and apricots. It is common to cook vegetables with meat and one good example is the Kokur Nadru. Wazhawan (traditional Kashmiri cooking) is a unique concept in the world of Kashmiri cooking as it comprises mostly of non-vegetarian dishes that are rich and aromatic. The guests are segregated into group of four who share a large metal plate called trami. First in line is the ritual of washing hands in a basin held by attendants. As this tash-t-nari is taken away, a ceremonious entry by a retinue of attendants is made: bearing tramis heaped with fragrant rice, quartered with long seekh kababs and dotted with a variety of rich chicken preparations. Relishes like raitas and chutneys look pretty in small earthernware bowls. As each trami is consumed, a new one is brought in till the feast runs its course of thirty six presentations: sometimes even thirty of them being based on meat! It is a revelation that a very high percentage of Kashmiris are meat eaters including the Brahmins or Kashmiri Pandits, who even though are meat eaters many of them refrain from eating garlic and onion. Other influences are that of the Muslim and Rajput styles of cooking. A fantastic taste of Kashmir’s rich cuisine exists in Rogan Josh. Traditional Kashmiri Rogan Josh has thin gravy and a thick layer of oil on top. This dish is best enjoyed with steaming hot boiled rice. Quality of meat plays an important role in this dish. Select meat with a lot of fat. After the Holi weekend filled with colours, food and masti…here comes another Monday morning at the office! And just after the meeting with Endemol for the channel, in office, I’ve to rush to Filmistan for another schedule of the Teen Patti shoot for FoodFood, beginning today and wrapping up just before I leave for my US trip. After the entire hectic week, I finally leave for US on March 27, 2011 for almost a 15 day trip, for two events that are scheduled there. 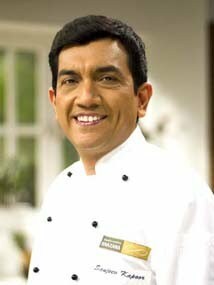 I am really excited, as usual, about the launch of my new book How to Cook Indian. The evening of April 1, 2011 will include the book launch at Indique Heights, Wisconsin Circle followed by dinner reception and conversation. Then comes The Varli Food Festival on April 7, 2011 where I will indulge the guests in a cooking show on center stage. My participation in this will take me to New York. By the time I finish all of this, it will be time for me to return back to my homeland, tentatively by the 10th of April, 2011. Indian starters – perfect ice breakers at a party! Whenever you plan a party or a cocktail dinner, the highlight will be the starters. In fact, the main course will be secondary for two reasons: one, the guests will be semi full on the starters and two, the main course has to be balanced with the variety of starters. Balance out vegetarian and non-vegetarians ones so that the count is not lopsided (maybe equal number of items). When you have a big party and starters are being served with drinks then you can make one task easy for the guests – the task of choosing between vegetarian and non vegetarian items by distinguishing the service people by their jackets. Announce that loud often. Always keep children in mind. Believe me they are not interested in what you like. Make interesting things as per the likes and dislikes of today’s children, and you will definitely have their attention. Indian starters such as Angoori Paneer Tikka is loved by them. Keep a balance in the method of cooking while serving starters with drinks. Shallow fried, stirred, deep fried, baked, grilled/barbecued/tandoori, broiled etc. Let your guests get a choice. Vegetable Nizami Seekh could be one. Don’t delay much in serving food after serving starters and drinks. People find it uncomfortable to eat after their normal eating time when hunger pangs are no longer there! Specially when kids are around, see to it that food is served at the appropriate time. Have sufficient quantities of dips/chutneys at hand. You should never fall short of these because these add the punch to the starter. For a cocktail party what kind of starters should you serve? For a cocktail party the starters should be more finger foods and served in bite sized portions. Always prepare a selection of items that can be served at room temperature. That way you do not have to worry that your hot starter will be getting cold. In other words, the items should be such that can be prepared in advance and kept. And even if you wish to serve them hot they could be popped into the microwave oven for a minute or two before serving. One good Indian starter would be Kheema Samosa. Consider the colours of the food that will be served together and make sure there is variety. Colours and textures of the various starters should complement each other. Also do not repeat the main ingredient. For example, do not serve a prawn cocktail and golden fried prawns together.